Take a trip back to Prohibition days any time you enter one of San Diego’s secret bars. Speakeasys are popping up all over San Diego and will instantly transport you back to the 1920s, without breaking the law. These vintage style bars offer old-school libations, crafted cocktails, and intimate ambiance. Be sure to hit all spots on our official guide to San Diego’s secret bars. Located in the Gaslamp neighborhood, Prohibition is styled as a vintage law office, owned by a man by the name of Eddie O’Hare. Once inside, you will be immersed in a secret underground location, old-time ambiance, and masterfully crafted cocktails. Secret Tip: Find the door to Eddie O’Hare’s law office on Fifth Avenue to enter the speakeasy. Looking for an intimate and exclusive bar serving unique libations amongst a wall of skulls? Noble Experiment is waiting for you. A reservation is the only way to get a seat in the immaculately-appointed space inside Neighborhood eatery in East Village. Secret Tip: The entrance of the speakeasy is through a wall of empty kegs, stacked along the wall near the restrooms. If you’re hanging out in North Park, dip into Seven Grand Whiskey Bar for a large selection of whiskey. Need more selection? Head to the back to find Bar Three Piece, a speakeasy nestled inside Seven Grand Whiskey Bar, home to over 250 patiently curated bottles of vintage iconic whiskey. In addition to whiskey, Nicaraguan cigars are available for purchase and paired with a drink of your choosing to be enjoyed on a private smoking patio. Secret Tip: Find a bottle you love? Bar Three Piece offers a Private Bottle Locker Program, which allows you to purchase your own bottle of whiskey and have it held in a locker for your enjoyment upon each visit. This 45-seat speakeasy is Kearny Mesa’s newest hotspot. Your journey starts in a white room decorated as a futuristic apothecary, inspired by an ancient manuscript of recipes and remedies stemming from ancient Chinese medicine. 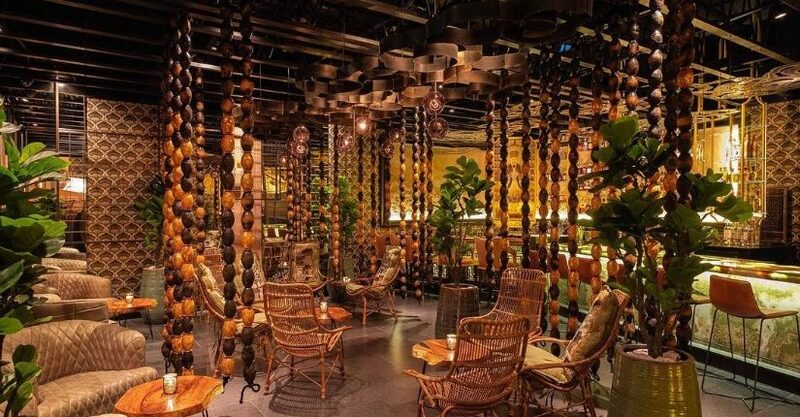 Continuing into the drinking den, guests are led down a portal to the past to find opulent seating, dramatic decorations and overhead sculptures to further enhance the spectacle created inside the Realm of 52 Remedies. Secret Tip: The 4-seat ‘Emperor’s Bar’ inside the Realm of 52 Remedies offers exclusive access to a collection of premium spirits.